Sarah Borkowski didn't have much free time during her years at Sauk Prairie High School. Whether she was participating on the school's dance team or on the drum line of the Eagles' marching band, the 18-year-old also worked diligently to keep herself on the school's honor roll. "I was definitely busy," she said. "I didn't have much free time." But Borkowski did make time to volunteer in her high school's special education classroom. "It was a real good learning experience for me," she said. "It provided me with a different outlook on other students in our school." Borkowski, who plans to study nursing at the University of Wisconsin-Oshkosh in the fall, said working with special needs students was a challenge at times, but it was an opportunity for her to help others. And John and Sarah Ramthun of Sauk City understand. The Ramthuns began the charity group 6:8 in May 2010. The charity is targeted at involving people in community service. 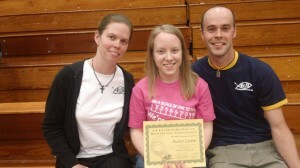 One of the couple's first goals for 6:8 was to start the silver cord program at Sauk Prairie High School. Under the program, students who complete 160 hours of community service before graduation receive a silver cord to wear during their graduation ceremony, like the gold honor cord for students with high grade point averages. "There is no requirement to participate in this program," John said. "Students can serve the community in what they enjoy doing or explore areas that they are interested in." This was the program's first year, John said. "We want to get the word out and get more students to help out in their community," he said. Borkowski's mother, Diane, said the silver cord program helps motivate young people to go into the community and help others. "It's a wonderful idea," she said. "It helps the students grow and see a different side of people they wouldn't normally see." Although the program only is entering its second year this fall, 15 Sauk Prairie High School students already have graduated with silver cords. Sauk City resident Andria Loether, 17, was one of them. She also was awarded a $500 scholarship by Ramthuns' charity for her volunteer work. "I've known John and Sarah since I was in the sixth grade," Loether said. "They base their youth ministry program on helping others and I really enjoyed volunteering at our vacation bible school at St. Aloysius Catholic Church. I like seeing how people react when you help them." Loether, who will be headed to UW-Oshkosh this fall to study nursing, said she wants to continue volunteering. "It takes time to volunteer, but it's fun," she said. Sauk City resident Mercedes Endres, 15, began with the silver cord program as a freshman last school year. Endres, who was heavily involved during the year with student council, French Club and vacation bible school, made it a priority to volunteer. "I had already known John and Sarah and when they had an information booth at our school I met with them and decided this was something I wanted to do," Endres said. "We went down to Mississippi on a mission trip with about 60 others and took food down to the people there and helped build a house." For more information on the silver cord program, visit www.makingservicepersonal.org or call the Ramthuns at (608) 658-4700.